I don't know what it's all about. Maybe its because it is deep Winter and I am a little stir crazy. Maybe its a natural progression after all these years of sewing. Maybe Mercury is in retrograde. I don't know what's making me do it, but I am all about the hand stitching lately. 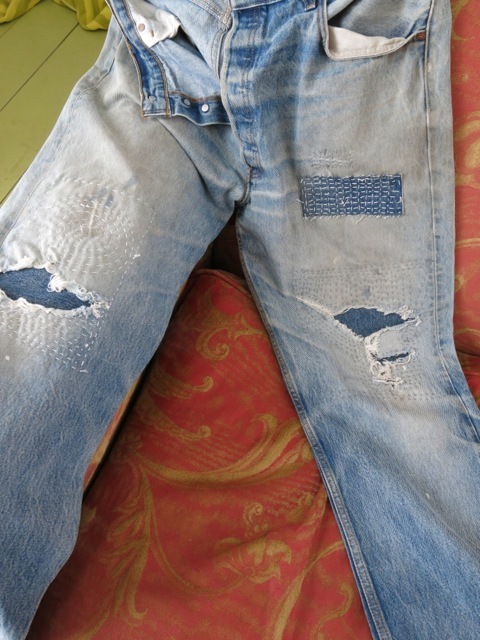 This is a pair of Don's jeans that I collect to save the old denim. But they still fit, they're nicely broken in and he needs pants. So I thought, why not use the legs of some unsalvageable jeans to mend this pair. I have become a bit fanatic about not throwing out any cloth, so I have tons of pairs of his old jeans, which always wear out the same way. I spent a couple of evenings with button thread and mended them all up. I greatly enjoyed this process. Then there is the Alabama Chanin skirt I have started work on. I bought a kit about a week ago and am almost done with the first panel. This stitching also makes me very happy. Although its a little challenging to do at night when I have to use artificial light. An Ott Lite would help greatly, but for now I will just stitch during daylight. It is a very soothing process. Then there is the Shibori stitching. We had the first session of the first workshop this weekend and my head is spinning from all the possibilities. What you see here are my samples stitched during the session. I have two 3-yard pieces of linen blends that I would like to stitch and dye to make clothes. Have an image in my head of a Tova dress out of Shibori circles in Indigo. I may get this stitched up in time to dip in the Indigo vat by next Saturday. But then I may not. But if I don't, we now have an Indigo vat on premises that will live at AGOS. So Indigo dyeing can happen any time. Oh the projects we can make. So right now I am up to my eyeballs in hand stitching and loving it. Don't worry, I still rely on my sewing machine, there is nothing like it for constructing quilts, and making clothing. But it feels good, right, to slow down and stitch some by hand. How about you? 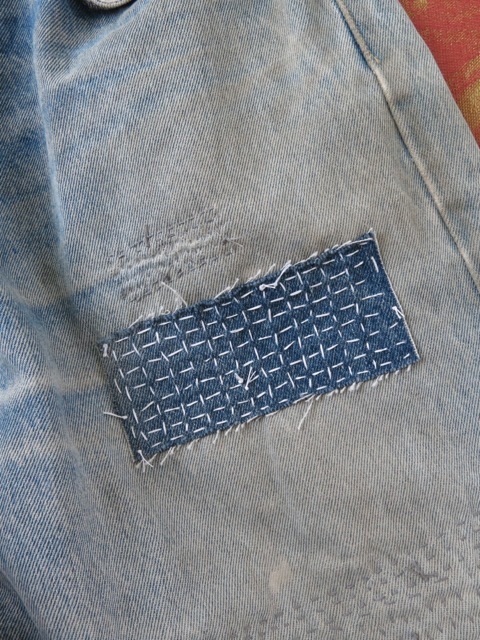 Do you like hand stitching?